"If it's both terrifying and amazing than you should definitely pursue it." It would be easy to describe Julia Landauer as fearless. Whether she's speeding around the NASCAR racetrack, speaking in front of large crowds or conquering a rigorous academic program, she seems like the type of person who isn't afraid of any challenge. She'll be the first to tell you, however, that she does experience fear. In fact, defeating her fear is what motivates her. "A lot of people ask me if I'm scared to go racing and the short answer is yes," she said. "It is so exhilarating to push past the fear or to use fear to let you know that you're engaged." Landauer learned to confront her fear at age 10, when she first started racing go-karts. 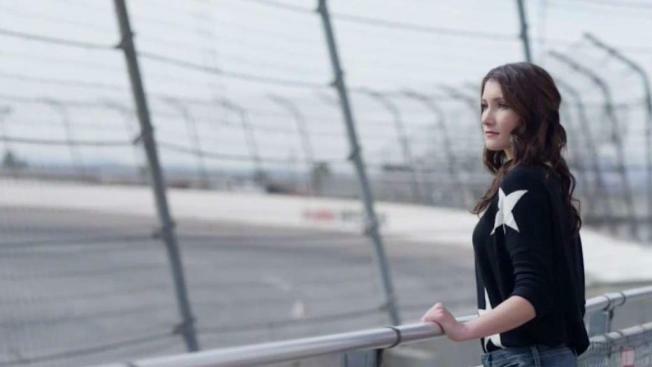 She switched to racing cars a few years later and won her first championship at 14. She eventually joined the professional ranks, competing and winning races against men in regional NASCAR divisions. She then took on a different challenge. She attended Stanford University to study science technology. Her technical expertise gives her a leg up on her competition. "It allowed me to learn a lot of different subjects that still come back and help me with my racing career today," she said. By any measure, Landauer could be considered successful. But she soon noticed that she didn't see a lot of other women celebrating similar successes. "I didn't hear a lot of women being proud of being winners or being proud of liking winning," she said. That's when she started giving motivational talks in hopes of encouraging women and girls to overcome the things that scare them and not be afraid to acknowledge their victories. "If we can one-by-one try to... normalize women and girls being proud of themselves, I think that's huge for the overall movement," she said. "Being able to inspire younger girls, younger people to be OK with being afraid and still pushing through that I think is so powerful." She's specifically passionate about getting more girls to pursue careers in science and technology, fields where women are dramatically underrepresented. She hopes to pass along the attitude that has served her so well in life: Find your fear then dominate it. "If it's both terrifying and amazing then you should definitely pursue it," she said.